I have my first finished quilt in 2015 to show: Plus One! 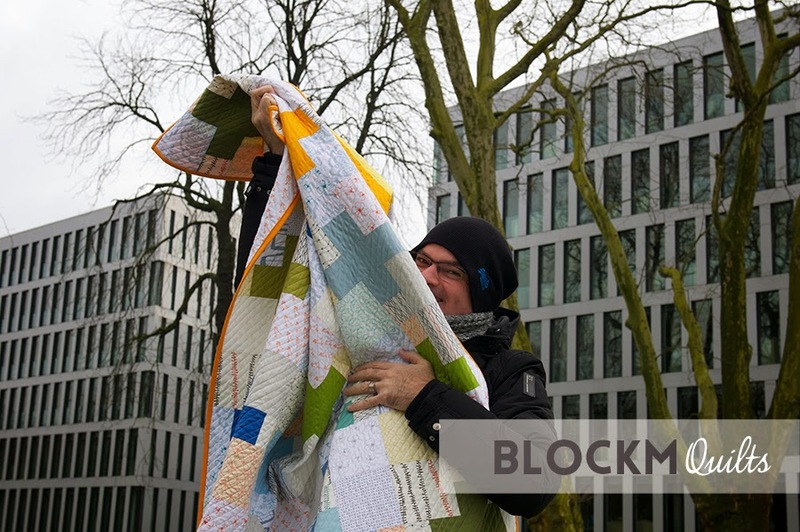 I showed photos of the first plus blocks already in November in line with my turn of the Around The World Blog Tour as it was still in progress. Now it's finally finished and I'm very happy how it turned out! 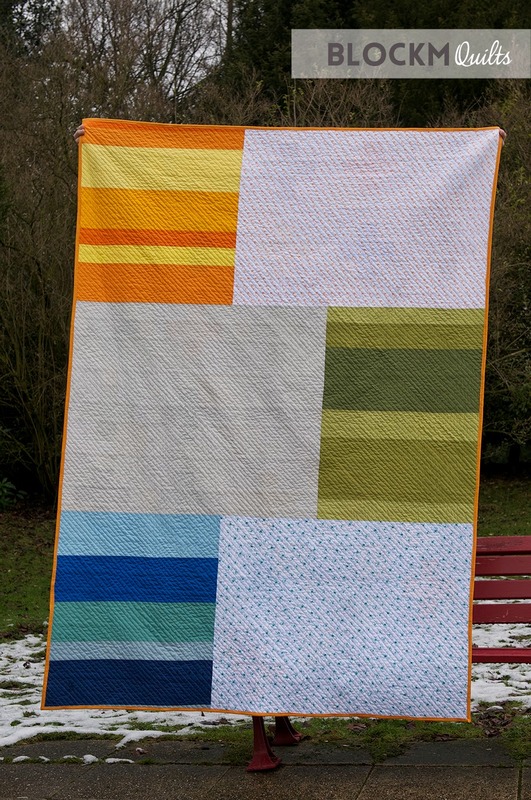 I used a selection of solid fabrics in different shades of green, orange, yellow and blue. 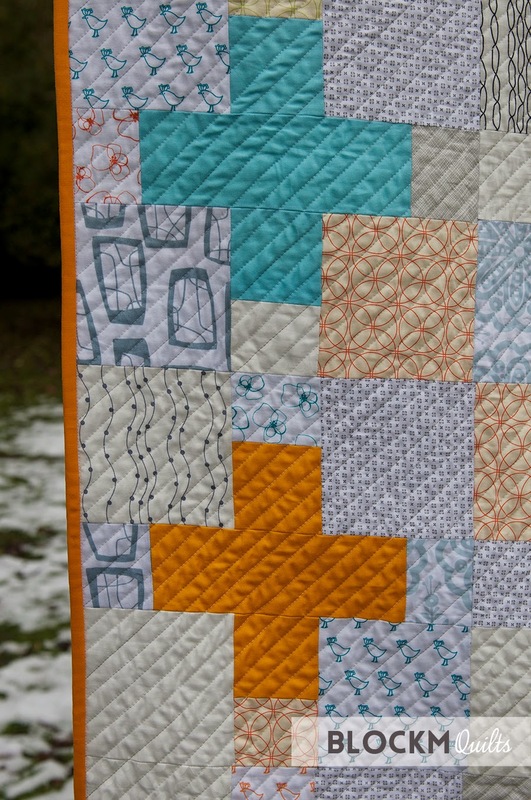 Ever since I've seen this beautiful quilt by NZ quilter Adrianne of 'On the windy side' I wanted to make one myself and started collecting lots of low volume fabrics and started sewing the first blocks. I went with a simple diagonal straight line quilting with what will be my all time favourite Aurifil thread with colour shades from white to light grey. 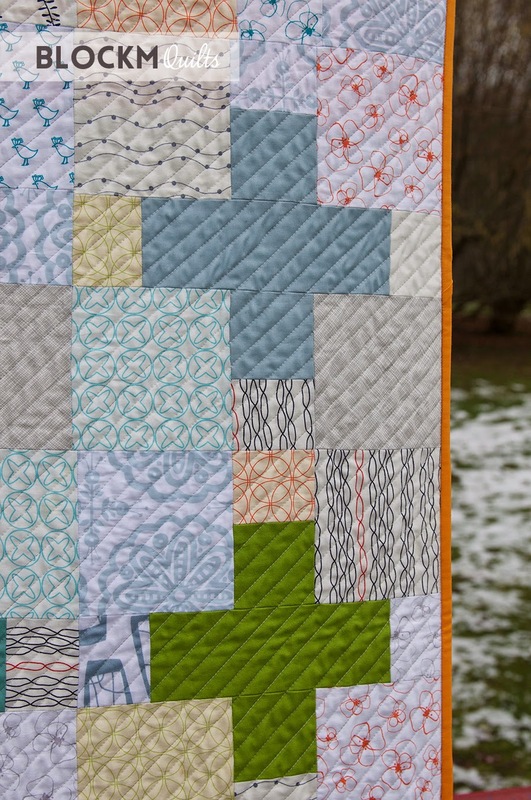 The colour changes of the thread are so subtle but still visible and give the quilting a beautiful depth. Almost as nice as the front! I just love the little orange birdies of Lotta Jansdotter's fabric line 'Bella'! So why is there a 'one' in the quilt? Well first of all I always try to come up with something different in my quilt designs, even if it is a quilt block design which has been done so many times by other quilters. In this case I just wanted to add a bit of interest and draw the attention to the 'one' in the quilt as it stands for my 'plus one' - my husband! I placed the 'one' so that when I'm wrapped up in the quilt on our couch that the 'one' points towards my husband.... awww! Always supporting me and holding up my quilts for photo shootings - thank you! I really like the +1 idea, the next baby quilt I'll do might have l+l=ll in lovely baby colours? I'll see how this turns out. Already excited about that! I had a few difficulties with these blocks at the beginning.... I will do another blog post about it later and will also tell you about how I did the straight line quilting. 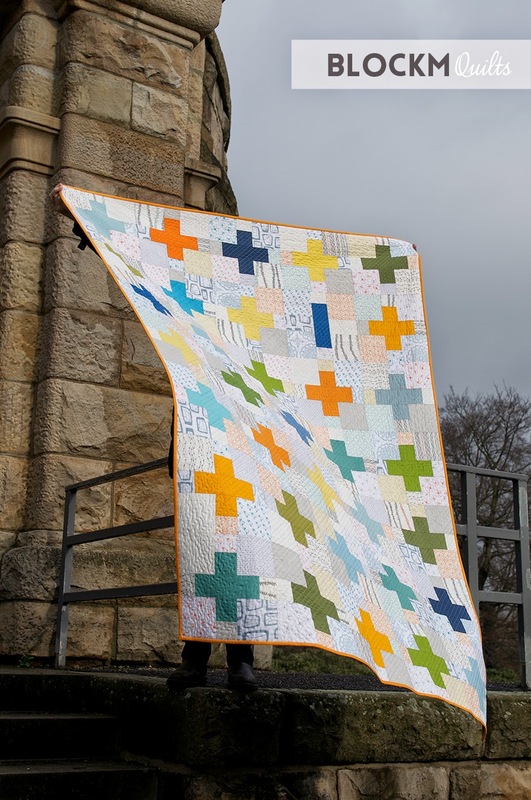 Linking this to the German Montagsmacher and Crazy Mom Quilts! I love it! All the low volume fabrics play beautifully with the bright colors you've chosen. Love, love, love it! Lovely quilt. Hope you are settling in well after 6 years in Eire. Thanks Iris! Yes, I have settled in but I do miss Ireland! We have lived close to the sea and I miss the fresh air and going to the coast at weekends. But all this is only a couple of hours journey away! Vielen Dank, Martina! 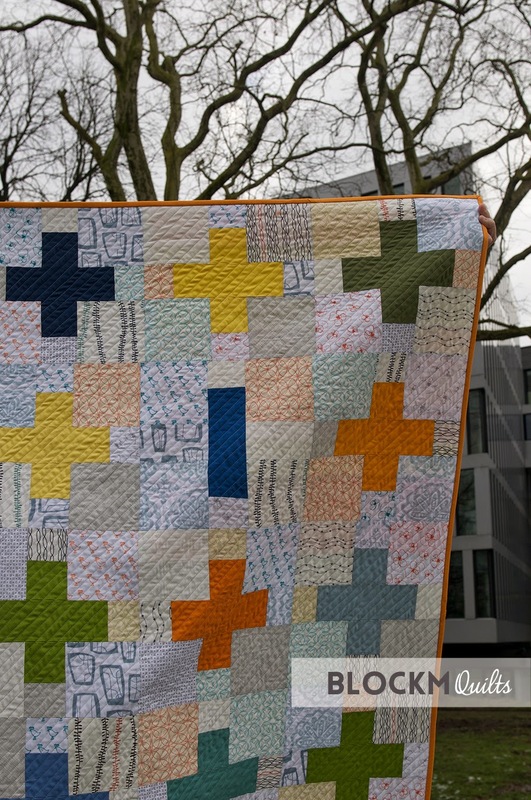 Der naechste Blog Post wird die Entstehung des Quilts zeigen! You have made another special quilt! I love that the plus one is for your lovin hubs:) and the back is like a whole nother quilt! It is just beautiful! You never cease to amaze me...I always love to see your next accomplishment!!! Thanks so much, Sarah! I also like the back very much, it makes me play around with solids! 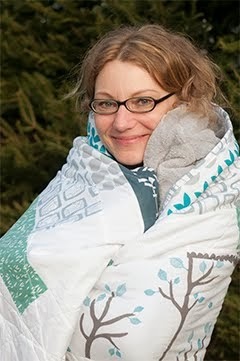 This quilt feels like a big accomplishment indeed, the quilting especially! This looks great, I've wanted to do one since seeing Adrianne's one too! I like how you used solids for the pluses. Thank you, Sarah! This is so far the most colourful quilt I made, I think sticking to four basic colours and the using different shades worked well, I'm very happy how it turned out! Thanks for visiting aaaaall the way from New Zealand, love your blog! Einfach klasse! Diese Farben, die Zusammenstellung mit den low volume Hintergrundstoffen und dem orangenen Binding! 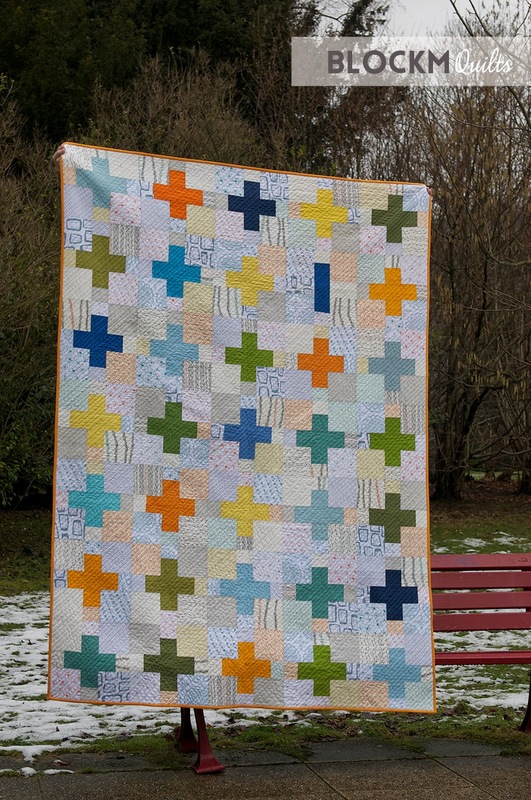 What a fun plus quilt and I love the diagonal quilting! Thanks so much Sheri! The quilting was a lot of fun! Awesome quilt, I love the back! Thanks, Kat! I always try to come up with quilt backs which accommodate the front ,this was especially fun! Thank you, Denise! The +1 would make a great baby quilt too! It's gorgeous! Sehr schön! Très joli! Thank you! Vielen Dank! Merci bien!